James Flames has captured some of the best parts of winter that everyone I run into tends to forget. Everyone I’ve run into can’t wait for winter to be over, enough of the cold weather and a little snow is too much snow. 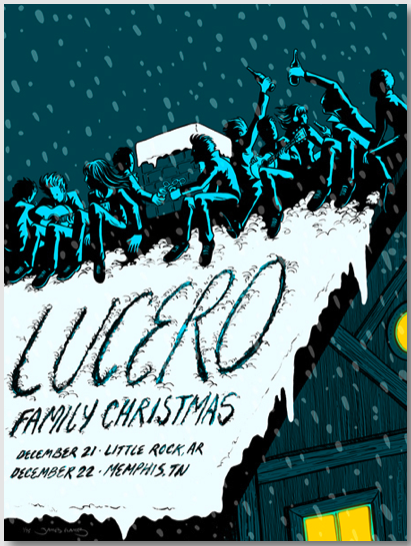 James Flames explains it all in one of his newest posters for Lucero’s winter shows. The cold weather and snow brings family and friends together whether it’s shoveling your way out or drinking a few winter ales to the sounds of Lucero. Winter is only a few months; appreciate the little things before it’s gone. This entry was posted in Uncategorized and tagged Art, Gig Poster, James Flames, Lucero, Snow, Winter. Bookmark the permalink.